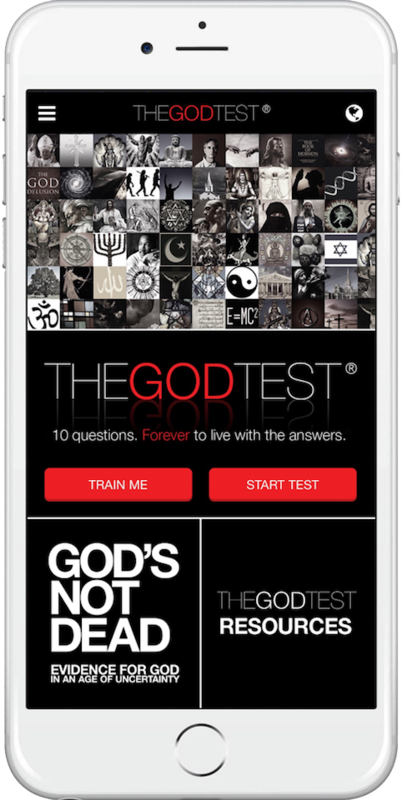 THEGODTEST App is a evangelism tool that helps facilitate dialog on the critical issues of faith, skepticism, and the meaning of life - leading ultimately to a presentation of the Gospel. The central question is: “Do you believe in God?” There are 10 questions for those who believe in God and 10 different questions for those who don’t. Currently, over 900,000 answers from 173 countries have been collected and submitted to the largest global survey on God! THEGODTEST is meant to be used in one on one or small group discussions. However, it has also been used in settings with larger audiences. Designed to promote interest and openness from the start, it features images from every stream of religion, philosophy and science. The idea is to communicate the desire for an open & honest conversation. Extensive use of this app around the world has proven that asking people questions and listening thoroughly to their answers causes the entire experience to be seen as positive. As one campus minister said, "Atheists have actually thanked us because of the impact of THEGODTEST conversation". Research shows that in North America, only 3% of churches grow through Evangelism. Additionally, surveys have suggested that a staggering number of young people will discard their faith once they leave high school for college. The evidence for God is overwhelming. Yet most Christians don't know it and therefore can’t communicate it to others. THEGODTEST App is a simple, revolutionary tool that gives believers a practical strategy for evangelism and the confidence to defend their fath. FOR THE FREE APP & TRAINING VIDEOS, CLICK HERE. FOR THEGODTEST STUDY GUIDE, CLICK HERE. 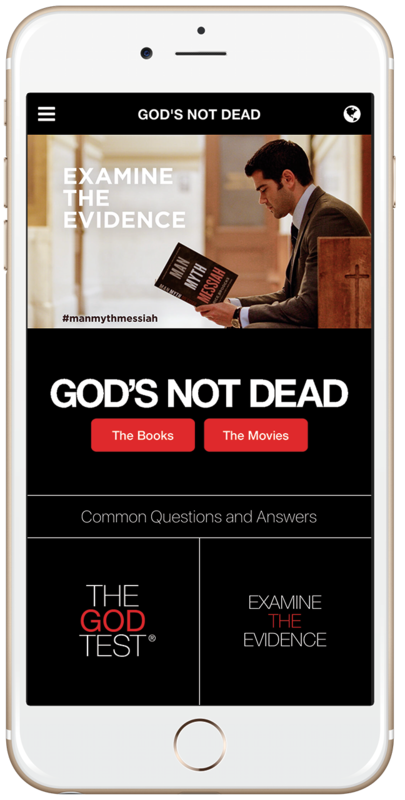 The free GOD'S NOT DEAD App explains the evidence for the Christian faith, as featured in the GOD’S NOT DEAD movies and in the books by Dr. Rice Broocks. The home screen link provides quick answers to the most common and challenging religious questions. It also contains many in-depth study resources to equip believers to help non-believers understand the reasonable evidence for God in this age of uncertainty. This free GODS NOT DEAD app also encourages users with messages of daily encouragement. The GODS NOT DEAD app prepares you to face the challenges of an unbelieving culture. So download the app today and deepen your understanding of the evidence for God! COMING SOON: THE DEFENDERS OF THE FAITH! A free 10-part video-training walk-through of the GOD'S NOT DEAD book by author Dr. Rice Broocks. After you complete the video sessions and answer the questions related to the training, you'll receive a "Defenders Of The Faith" recognition of the completion of the course.